My background design assignment illustration. 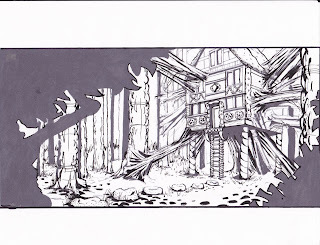 My class has to take a story set in a house in a forest and draw said house in forest (i have a headache, grammar baded). I'm trying a new look for the old lady-cannibal's candy house. Webs made of cotton candy connect the house to the trees to give the house a more disconcerting appearance. I also tried to use a Beatrix Potter-like style. That was difficult considering she works in watercolors and I work in ink.